Figure 2: Active faults and geologic map of Leyte (Edited from: http://www.phivolcs.dost.gov.ph). (R) to (PG1) are sedimentary rocks while (BC) is for pre-Jurassic basement complex of undifferentiated amphibolites, mics schists, quartzofeldspars and phylliste-slates. (NI) to (UC) are intrusive rocks while (QVP) to (N1) are volcanic rocks. Map modified from the Phivolcs active faults map and MGB geological map. PALO, Leyte –The Philippine Institute of Volcanology and Seismology (Phivolcs) has warned of a possible strong earthquake in central Leyte as the Philippine Fault in the province never had significant shaking in more than 100 years. Phivolcs Director Renato Solidum told reporters on Wednesday that a 100-meter portion of the Philippine Fault system stretching from Albuera to Mahaplag towns in Leyte is ripe enough for a strong earthquake. “If the fault line in the central part of Leyte would move at magnitude 7.2, consequently, an Intensity 8 earthquake may affect many populated areas of Leyte,” Solidum said. The recent shaking of a connected fault line segment, such as the July 6, 2017 earthquake that struck Kananga, Leyte and Ormoc City, may trigger movements of the Philippine Fault, the Phivolcs official said. “There are movements but very weak since 1900 until the present. We don’t know when the major earthquake will happen, but people have to be aware,” Solidum told reporters. The Phivolcs chief asked local government units (LGUs) to relocate houses within fault lines to prevent loss of lives and serious damage to properties. Leyte Governor Leopoldo Dominico Petilla said LGUs, especially those near the fault line, have been preparing for the possible earthquake. “Apart from implementing the updated National Building Code, we will also come up with a local building code to ensure that concrete buildings are safe from earthquakes,” Petilla added. 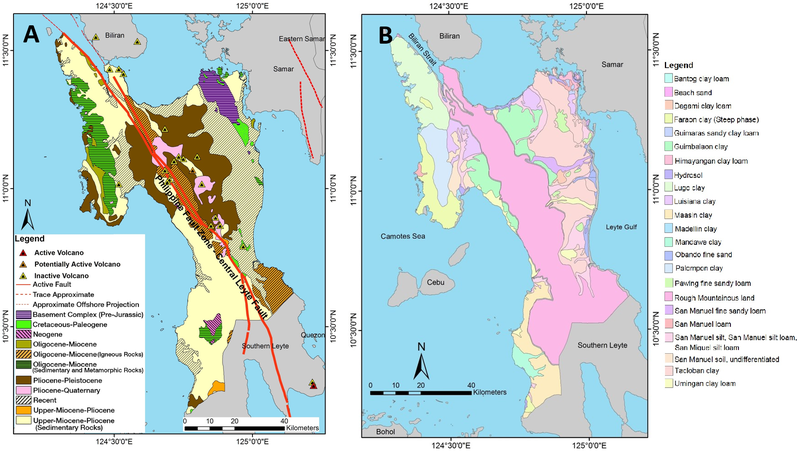 The Leyte Island fault line is part of the 1,200-km.-long Philippine fault zone, a major tectonic feature that transects the whole Philippine archipelago from northwestern Luzon to southeastern Mindanao. This arc-parallel and left-lateral strike slip fault is divided into several segments and has been the source of large-magnitude earthquakes in recent years, such as the 1973 Ragay Gulf earthquake (magnitude 7), 1990 Luzon earthquake (magnitude 7.7), and 2003 Masbate earthquake (magnitude 6.2). The high seismic risk posed by this fault zone requires a large-scale active faults map, a fundamental data set for seismic hazard mitigation. “The record of Palo seismic station is very important for the monitoring of movements of the Philippine Fault and Philippine Trench. Our present location is very ideal for seismic station since we are on top of bedrock,” Solidum said.